Eye on the World | So Many Exciting and Beautiful Places! Our first priority (OK, my first priority) for the day was The London Eye. Built to commemorate the New Millennium, this Ferris Wheel stands just under 400 feet, and carried its first passengers on February 1, 2000. It is Europe’s tallest Ferris Wheel, and takes 30 minutes for a full rotation. Approximately 3.75 million passengers ride each year, and we are part of the total for 2015. Yay!! Each gondola can carry about 25 passengers. Some of London’s buildings have interesting profiles, and Londoners love to give them nicknames. In fact, when leaving later today, I was reading The Spectator Magazine which had a delightful cartoon about “The evolving London skyline.” I hope it amuses you as much as it did me. The Walkie-talkie, The Cheese Grater and the Gherkin. You can decide which is which. Next, we visited Kensington Palace located in Kensington Park. I really wanted to see the dresses … in case I wanted to buy one, of course. There were exhibits for Queen Elizabeth’s dresses, Princess Diana’s dresses, and Queen Victoria’s as well. There were some beautiful gardens as well, but they weren’t dresses, so I skipped them. In the afternoon, we took the Eurail to Paris through the Chunnel, a 31 mile rail tunnel linking the United Kingdom with France. It was fast, with speeds about 125 mph and more, but bumpy. There was certainly more space than on an airplane, but I still prefer flying. We arrived in Paris around 6:00 pm, and then met our friends, Jan and Brian for a bite. On the way, we walked by the Galleries Lafayette, a huge department store, which I wish I could explore further. 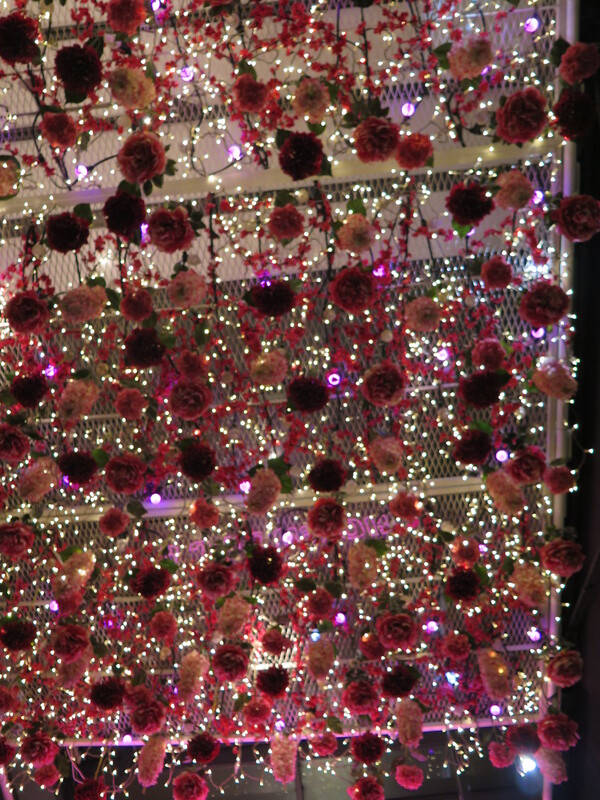 The lighting above the sidewalks includes flowers among the lights – beautiful. This entry was posted in Europe, London and tagged Chunnel, Galleries Lafayette, Kensington Palace, London Architecture, The London Eye. Bookmark the permalink.